The developed world is facing an insidious healthcare epidemic. Via a confluence of medical breakthroughs, primarily in neonatology and infectious disease, we have benefitted from a jump in life expectancy since the early 1900s. Yet, these advances have been deceptive. Our success in addressing some of the most immediately preventable causes of death have masked the fact that morbidity has been gradually increasing over the last century and a half, with a rapid increase over the last twenty years. Today, the average elderly male spends 7.7 years in increasing medical dependency before death and the average female over 10 years. Moreover, there is a steadily increasing progression of morbidity prior to these years of dependency. The main reason why our society has been getting progressively sicker despite our medical advances is because of the widespread development of a constellation of interrelated diseases known as the metabolic syndrome. The metabolic syndrome is classically defined as a disease whose primary manifestations are a dysregulation of glucose and insulin metabolism, dyslipidemia, hypertension, and suboptimal excesses of visceral adipose tissue. It is well known that the metabolic syndrome is strongly associated with, and causative of, many instances of gout, polycystic ovary syndrome, myocardial infarction, stroke, and dementia. To borrow from Greek mythology, its disparate manifestations are like a many-headed hydra, with each head representing a different “disease” but with each head attached to the same body of pathology. Yet this hydra has at least one more head. And while this head is less well known than the others, it is no less important. It is common knowledge that the metabolic syndrome causes gout, diabetes, and heart disease. It is less well known that the metabolic syndrome is also the cause of many cases of osteoarthritis, or the type of arthritis more traditionally thought to be only from “wear and tear.” The metabolic syndrome appears to not just cause arthritis in the weight bearing joints, where bad mechanics can play a role, but in the hands, elbows, and every other non-weight bearing joint of the appendicular skeleton. And there are now numerous studies showing that osteoarthritis of the spine (also known as spondylosis) is also often caused by the metabolic syndrome. This new understanding of how a vast amount of arthritis and pain are caused is a game changer. We now know that the pain and debility associated with osteoarthritis has at least as much to do with physiology as it does with mechanics. Perhaps the most salient physiology linking the metabolic syndrome to arthritis involves the visceral adipose tissue (VAT). VAT is the “white” adipose tissue that is in the viscera, as opposed to the white adipose tissue under the skin. The main purpose of VAT was previously thought to be just to store extra fat. We now know that our previous understanding was not just incomplete but misleading. VAT is actually an important endocrine organ that has the capacity to produce inflammation and cause profound destructive systemic effects. VAT is one of the primary generators of such pro-inflammatory cytokines as interleuken-6 (IL-6) and tumor necrosis factor-alpha (TNF-alpha). VAT leads to a decrease in the anti-inflammatory cytokines IL-10 and adiponectin as well. It also causes an increase in phospholipase A2. Regarding the latter, note that corticosteroids, still one of the mainstays for injection therapy for numerous arthritides, works by inhibiting phospholipase A2. VAT is thus akin to the anti-corticosteroid injection. But this is not the end of the ways that the metabolic syndrome destroys joints and causes pain. The vascular diseases associated with the metabolic syndrome, including small vessel occlusion and venous stasis, predisposes individuals to subchondral bone ischemia and poor nutrient and gas exchange in the joint cartilage. The problem of the metabolic syndrome from too much visceral adipose tissue is compounded by a general lack of muscle, or sarcopenia, that is also becoming ever more prevalent in our patient populations. Robust skeletal muscle mass is an excellent insulin sensitizer and acts as a “glucose sink”, stabilizing the metabolic abnormalities that are part and parcel with the metabolic syndrome. Skeletal muscle also acts on the periosteum on a cellular level, establishing a normalization of metabolic function and improving bone density, chondrocyte health, and other factors implicit to bone and joint health. A lack of adequate skeletal muscle is therefore not just bad mechanically, but it worsens the destructive potential of the metabolic syndrome physiologically. Thus we now know of many ways in which the metabolic syndrome wrecks havoc on bones, joints, and their surrounding tissue. Above are a few of these ways and this is by no means an exhaustive list. The physiological causes of osteoarthritic pain from the metabolic syndrome are important as they explain why so many more people are now experiencing arthritic pain, particularly of the low back. Back pain has been with us since time immemorial. Even Otzi, the tattooed mummy unearthed in the Alps and thought to have lived about 6,500 years ago, had some spondylosis. Spondylosis is nothing new and, like wrinkles of the skin, seems to usually be a normal part of the aging process. And, like spondylosis, some degree of back pain has been with humans since the very beginning of our species. Back pain has classically been the second most common reason to visit the doctor, just after upper respiratory tract infections. Yet, while spondylosis and back pain are part of the human condition, the prevalence and severity of back pain has been increasing tremendously in recent years, in lockstep with the tremendous increases with the other manifestations of the metabolic syndrome. From Gandhi R, Woo KM, Zywiel MG, Rampersaud YR. Metabolic Syndrome Increases the Prevalence of Spine Osteoarthritis. Orthopaedic Surgery, 2014, 6: 23-27. In order to appreciate the magnitude of the problem, it is helpful to look at some of the numbers. Low back pain has a direct cost in the United States of 70 billion dollars annually, with an indirect cost of up to $130 billion. Nearly 150 million workdays in the United States are lost every year because of low back pain. The worldwide incidence of back pain is 5% a year, with recurrence in one year ranging from 24-80%, depending on which study is favored. And the problem continues to get worse. European studies have shown a quadrupling of low back pain workdays lost over the late twentieth century with similar trends in the United States. Obesity is associated with “the anti-epidural steroid injection” phospholipase A2. An increased body mass index (BMI) is associated with more phospholipase A2 whether or not the individual also has insulin resistant diabetes mellitus (IDDM). IDDM is also a manifestation of the metabolic syndrome. 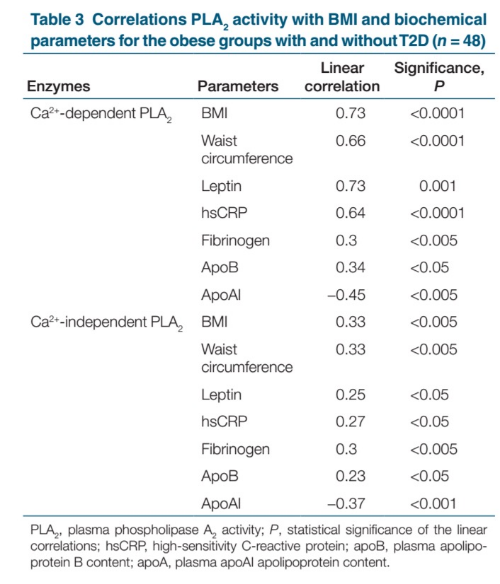 From Fernandez A, Garces F, Hurt-Camejo E, López F, Camejo G, Niño C, Apitz-Castro R. High Plasma Phospholipase A2 Activity, Inflammation Markers, and LDL Alterations in Obesity With or Without Type 2 Diabetes. Obesity (2010) 18, 2023–2029. And consider this in correlation with the astronomical rise in obesity over the last two decades. According to the CDC, in both 1994 and 2010, Alabama was the second most obese state in the union. Yet, if you took the percentage of Alabamians who were obese in 1994 and transferred them to 2010, Alabama would be the leanest state in the union. And things have only worsened over the last five years. These findings are important for three reasons. The first reason is that it shows that arthritic pain is an incredibly important disease whose etiology now looks to be vastly more complicated than previously appreciated. The second reason is it shows that in many ways the Pain Physician is treating manifestations of the same pathology as Cardiologists, Endocrinologists, Nephrologists, and General Practitioners. The third reason is that it gives us guidance as to the optimal treatment of our patient’s chief complaints. A relatively normal lumbar (or low back) spine as seen from the sagittal or side view on MRI. This type of MRI imaging is called a T2 MRI. You can usually tell a T2 MRI as both fat and water are white. The only abnormality of this lumbar spine, which is of questionable significance, is the loss of water content in the lowest three disks, especially the lowest two (L4/5 and L5/S1). This is termed “disk desiccation”. Like wrinkles of the skin, this is usually a normal finding with aging and is not usually associated with pain or dysfunction. Relatively severe spine osteoarthritis, or spondylosis from one of my patients (permission granted to use his MRI images). Since the primary way by which the metabolic syndrome leads to pain and osteoarthritis is physiological, this opens up opportunities to treat some of these conditions pharmacologically and interventionally. As mentioned earlier, this is already done somewhat with treatments such as corticosteroid injection therapy. Visceral adipose tissue produces phospholipase A2, which leads to the production of pro-inflammatory cytokines. Corticosteroids inhibit phospholipase A2. Likewise, the metabolic syndrome is associated with an increase in TNF-alpha. There is some preliminary evidence that TNF-alpha inhibitors may help with osteoarthritic pain. While TNF-alpha inhibitors have classically been associated with the treatment of autoimmune pathologies, it thus makes sense why these could work with the much more common osteoarthritides. Leptin, adiponectin, and other cytokines may also be targets for pharmacological intervention. Furthermore, as the metabolic syndrome is associated with a variety of hormonal and neurohormonal issues (hypogonadism, etc), we may be able to leverage our better understanding of this pathology to address these as well. While pharmacological advances and procedural interventions are exciting, the most obvious guidance that this new knowledge gives us is the importance of addressing the root cause of the metabolic syndrome in general. The most important take away is that there is simply no substitute to a healthy lifestyle, including the diet and activity necessary to ensure that our patients are appropriately lean and well conditioned. Of course, the problem is this requires a tremendous amount of patient buy in. And it can be really difficult to get this buy in. But not all hope is lost. Smoking used to be vastly more prevalent than it is today. Yet due to a change in societal norms, including the advice of doctors, tobacco use has decreased dramatically. Hopefully, with enough time and perseverance, we can change the lifestyle factors that are the root cause of the metabolic syndrome and the increasing incidences of arthritic pain as well. In the meantime, perhaps we can also utilize our new and fuller understanding of the ultimate cause of many types of pain to design better interventions for those for whom lifestyle changes are not enough. Conaghan PG, Vanharanta H, Dieppe PA. Is progressive osteoarthritis an atheromatous vascular disease? Ann Rheum Dis, 2005, 64: 1539–1541. Gandhi R, Woo KM, Zywiel MG, Rampersaud YR. Metabolic Syndrome Increases the Prevalence of Spine Osteoarthritis. Orthopaedic Surgery, 2014, 6: 23-27. Alam I, Lewis K, Stephens JW, Baxter JN. Obesity, metabolic syndrome, and sleep apnoea: all pro-inflammatory states. Obesity Reviews, 2007, 8: 119-127. Katz JD, Agrawal S, Velasquez M. Getting to the heart of the matter: osteoarthritis takes its place as part of the metabolic syndrome. Current Opinion in Rheumatology, 2010, 22:512-519.